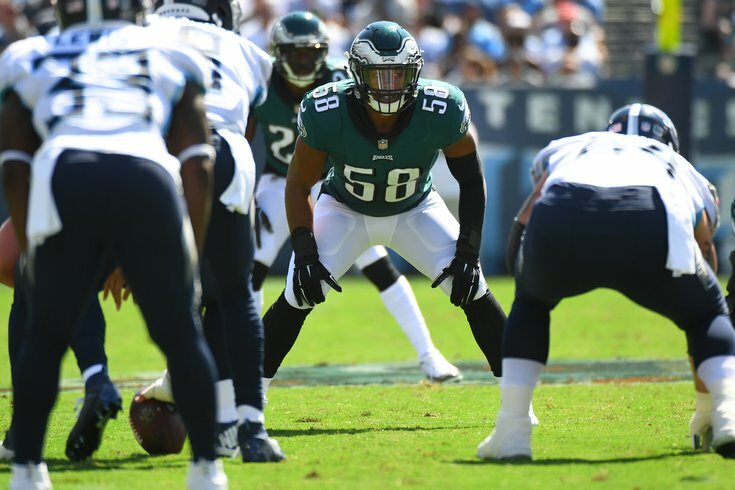 In each of the last three years under Doug Pederson and Jim Schwartz, the Philadelphia Eagles entered the season with Jordan Hicks as their starting middle linebacker. Hicks started all 16 games in 2016, but was lost for the season after seven games in 2017 with a torn Achilles, and he missed four games in 2018 with a calf injury. In relief of Hicks, Nigel Bradham assumed radio helmet duties, getting the defense into Schwartz's play calls, as well as the rest of Hicks' pre-snap responsibilities. Schwartz often praised Bradham for the way he took on those responsibilities, however, the Eagles' preference — and likely Bradham's preference — would be to fly around and make plays without having to worry about those added responsibilities. Hicks left this offseason to sign with the Arizona Cardinals on a four-year deal worth $34 million that the Eagles were right not to try to match. However, his departure has left a hole in the Eagles' defense. This offseason the Eagles added L.J. Fort, now on his fifth team in the NFL, who has mostly been a special teamer and sub-package player over his career. They also brought back Paul Worrilow, who tore his ACL in OTAs anfter signing with the team last offseason. "L.J. was somebody we were really excited about acquiring," Howie Roseman said at the NFL annual meetings on Monday. "He was a guy we had our eye on throughout the season. He was a target free agent for us. We felt like he would be a really good fit in our scheme. "Paul was another guy that when we signed him we thought he would fit into what we do defensively. Obviously he had the ACL tear pretty early on. Incredibly hard worker. "And then we have Nigel back. Kamu Grugier-Hill is somebody who continues to grow as a player on defense. We have some young guys there, too. Nate Gerry, who we want to take another step. "But it goes back to the same question at the other positions. We’re continuing to look to improve our football team, and looking at every opportunity, both in tn the free agent market, draft, and trades." The Eagles have a lot of linebackers in the fold, but who is the starting middle linebacker? Roseman doesn't have an answer yet either. "Well, the good news is we don’t play for another six months," he said. The Eagles value quarterback, the offensive and defensive lines, and to a lesser degree, cornerbacks and receivers. The other positions, linebacker included, often get put on the back burner as a result. This is a formula that works, both with the Eagles, and other teams around the league that build their rosters in similar fashions. It's one that helped win the Eagles a Super Bowl in 2017. But, you know, they do still need a middle linebacker. More additions are likely coming.